The Capitulars have elected the Spanish Provincial Superiors in the course of the Provincial Chapters being held in Madrid (El Escorial). They will shortly be approving the composition of the Provincial Councils who will be responsible for steering the amalgamation process which was approved on 20 January at the Inter-Provincial Chapter, and which will be implemented in 2020. Both the Provincial Chapters and the Interprovincial Chapter have taken stock of the work already completed regarding the Structures, Mission, and Co-workers. On 15 January a group representing the Brothers jointly analysed the quadrennium with a group of Co-workers looking ahead to the future of Hospitality in Spain, and laid down the strategic guidelines for the Order in Spain over the next few years. The Provincial Chapters were presided at by the Superior General, Brother Jesús Etayo, and the General Councillors Brother Benigno Ramos and Brother Pascal Ahodegnon. Brother Juan José Ávila Ortega, of the Castile Province, has been appointed to serve as the Superior General’s Delegate for Spain to take forward the amalgamation of the 3 Provinces of Castile, Andalusia and Aragon into one single Province which will take place in 2020. The General Delegate will be the president of the Delegate Council made up of 5 members, namely, Brother José Miguel Valdés Grande (Prov. Andalusia) and Brother José Luis Marzo Calvo (Prov. Aragon), and the three Provincial Superiors. Brother Juan José Ávila was also appointed the new Director of the Juan Ciudad Foundation. The Interprovincial Chapter of the Hospitaller Order of St John of God in Spain convened for the fifth day, attended by 78 Brothers from the Provinces of Castile, Bética and Aragon. The most important decision taken regarding the future of the Order in Spain was the approval of the erection of a single Spanish Province in 2020, with a transitional two-year period beginning today. Another 30 proposals were also approved regarding the future in terms of 3 aspects - Structures, Brothers and Co-workers. Next week, the new governments of the three Provinces of Castile, Bética and Aragon will be elected, and the Superior General and his Council will appoint a Brother Delegate of Spain, to remain in office until 2020 working jointly with the newly elected Provincials to coordinate the amalgamation of the three Provinces in order to establish one single Spanish Province. In the morning session, the Interprovincial Chapter of the Hospitaller Order of St John of God was called to order at El Escorial under the theme “The future of Hospitality in Spain”, and will continue its deliberations until 25 January. It followed in the wake of the previous Provincial Chapters of the Order’s three Spanish Provinces – Castillo, Bética and Aragon. In his address, the Superior General of the Hospitaller Order, Brother Jesús Etayo, said, “as we are told by the Constitutions, the Provincial Chapter is the extraordinary governing body of the Province; it represents in a special way the inter-communion of the different local communities and their communion with the entire Order. It is therefore a major event in the life of the Provinces, its main objective being to evaluate and drive forward the Charism and the Mission of the Order in the Province according to the spirit of St John of God”. Brother Jesús went on to emphasise the fact that “the reality in which we are living today demands courageous responses and decisions to meet the challenges it is throwing down to us. Times have changed and our responses must also change,” always keeping the sick and the needy for whom we care for in our Institution as our centrepiece. 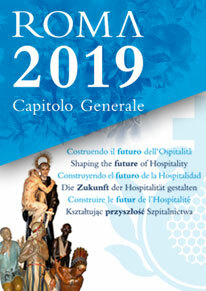 Altogether, 120 people, Brothers and Co-workers, will be attending the Interprovincial Chapter, and over the coming days they will be reflecting on and debating the future of the the Hospitaller Order in terms of three main issues: Structures, Co-Workers and Brothers. At the present time, the Hospitaller Order in Spain has a network of 75 social and health care centres, 220 Brothers, about 12,000 employees and 3,600 volunteers. On the first day, Chapter has elected Fr Francisco José Ruiz Pérez SJ, member of the Company of Jesus, as the moderator for the Interprovincial Chapter, tasked with drawing on his experience to help us with the process of discernment over the coming days. On the first day, the Instrumentum Laboris has been presented to the Chapter as the working paper forming the basis of the matters for debate at this Interprovincial Chapter, in addition to offering 29 proposals to be used as input for analysis and for the decisions to be adopted. This document was drafted by the Reflection Group on “The future of the Order in Spain, which had gathered the information, analysis and reflections that had emerged over the past three years with the Brothers and Co-workers of the 3 Spanish Provinces. This afternoon, and following the presentation of the Instrumentum Laboris, chapter is reflecting on the issue of the Structures of the Hospitaller Order in Spain.